Habitat: The Chokeberries are three species of deciduous shrubs native to eastern North America. They are most commonly found in wet woods and swamps. There are two well-known species, named after their fruit color, Red Chokeberry and Black Chokeberry, plus a Purple Chokeberry - natural hybrid of the two. Description: The leaves are alternate, simple, and oblanceolate with crenate margins and pinnate venation; in autumn the leaves turn a bold red color. Dark trichomes are present on the upper midrib surface. The flowers are small, with 5 petals and 5 sepals, and produced in corymbs of 10-25 together. Hypanthium is urn-shaped. The fruit is a small pome, with a very astringent, bitter flavor. 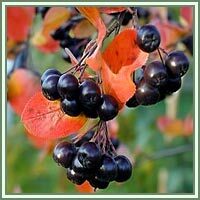 Black Chokeberry tends to be smaller, rarely exceeding 1m tall, rarely 3 m, and spreads readily by root sprouts. The leaves are smaller, not more than 6-cm wide, with terminal glands on leaf teeth and a glabrous underside. The flowers are white, 1.5 cm wide, with glabrous sepals. The fruit is black, 6-9mm wide, not persisting into winter. Red Chokeberry grows to 2-4m tall, rarely up to 6 m. Leaves are 5-8 cm wide and densely pubescent on the underside. The flowers are white or pale pink, 1 cm wide, with glandular sepals. The fruit is red, 4-10mm wide, persisting into winter. Purple Chokeberry' leaves are moderately pubescent on the underside. Few to no glands are present on the sepal surface. The fruit is dark purple to black, 7-10mm in width. Chokeberries are resistant to drought, insects, pollution, and disease. Medicinal use: Chokeberries has a high concentration of polyphenols and anthocyanins, stimulating circulation, protecting the urinary tract, and strengthening the heart. 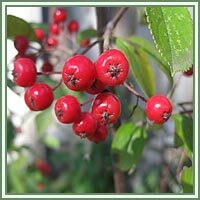 In many independent studies Chokeberry continues to show exceptional activity in fighting cancer.Juice from berries is astringent and not sweet, but high in vitamin C and antioxidants. Chokeberries' rich antioxidant content may be beneficial as a dietary preventative for reducing the risk of diseases caused by oxidative stress.